EMAIL US TODAY Find Us on Facebook! A. We perform free estimates to give you an accurate price for the job. This price is based upon a linear foot measurement; as well as spillway size, rock features, or pebble tec, when applicable. ​Q. What method do you use? A. The method we use is a form of media blasting. It's alot like sandblasting, but uses a softer material called Max Strip that is only blasted at 40-50 psi. It is water soluble and is not a dangerous chemical. Q. Will the method you use damage my tile? A. Prior to any blasting, we will inspect the tile to ensure that it is not soft or in bad condition. There are certain types of tile that we will not blast because of the potential for damage. We also check for loose or damaged tile. Occasionally, a loose tile will come away from the wall during a blast. This will be addressed with the client prior to agreement of tile blasting. False rockscapes are also a questionable surface for blasting and will be addressed with the clients. Q. How soon will the calcium come back? A. This is entirely up to the client. Most calcium buildup is preventable with a simple brushing of tile in your weekly maintenance routine. The more often you perform this practice, the less likely the reappearance of "the white line". A. It depends on the size of your pool and how bad the actual build up is. We usually approximate 4-5 hours. We do not require the client to stay at home; unless there is a crazy, man-eating dog. Then we encourage you to stay home. Q. How long do I have to wait to use my pool? A. You don't have to wait to jump in. It may take a couple of hours for the pool to become crystal clear, but usually, your pool will be swimmable immediately. Q. Do you offer monthly pool cleaning service or perform repairs? A. Afraid not. We can recommend a good local cleaning service for you that can help you out with maintenance or repairs. Q. How soon can I get my pool done? A. Give us a call. We will do our best to accomodate your busy schedule. We serve Tucson, Vail, Oro Valley, Sahuarita, Green Valley, Benson and Marana. 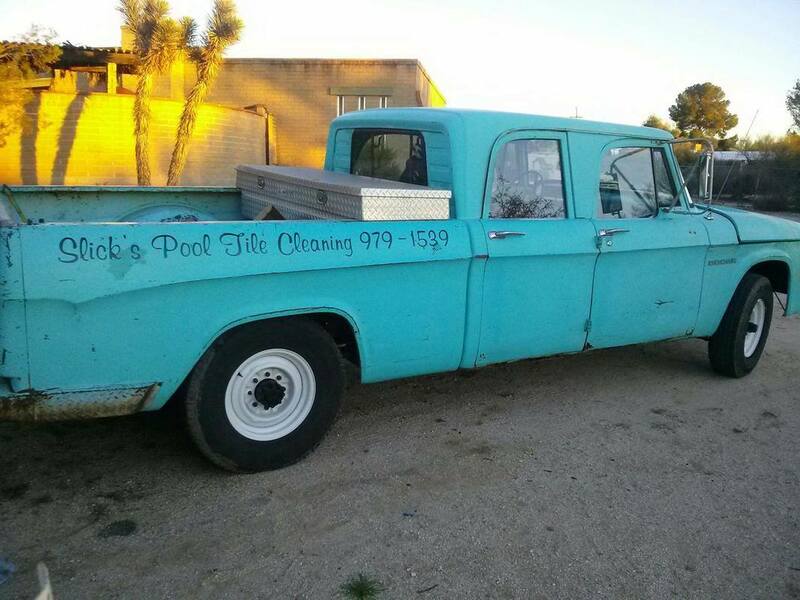 Hire Slick's Pool Tile Cleaning to be your Pool Tile Cleaner!